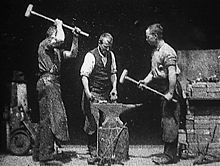 Blacksmith Scene (also known as Blacksmith Scene #1 and Blacksmithing Scene) is an 1893 American short black-and-white silent film directed by William K.L. Dickson, the Scottish-French inventor who, while under the employ of Thomas Edison, developed the first fully functional motion picture camera. It is historically significant as the first Kinetoscope film shown in public exhibition on May 9, 1893, and is the earliest known example of actors performing a role in a film. 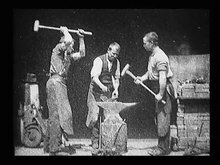 102 years later, in 1995, Blacksmithing Scene was selected for preservation in the United States National Film Registry by the Library of Congress as being "culturally, historically, or aesthetically significant". It is the second-oldest film included in the Registry, after Newark Athlete (1891). The scene is all filmed from a stationary camera. On screen is a large anvil with a blacksmith behind it and a striker to either side (portrayed by Edison employees). The smith uses a heated metal rod he has removed from a fire and places it on the anvil. All three begin a rhythmic hammering. After several blows, the metal rod is returned to the fire. One striker pulls out a bottle of beer, and they each take a drink. Following this drink, they then resume their work. The film was produced by the Edison Manufacturing Company, which had begun making films in 1890 under the direction of one of the earliest pioneers to film William K.L. Dickson. It was filmed entirely within the Black Maria studio at West Orange, New Jersey, in the United States, which is widely referred to as "America's First Movie Studio". It is believed to have been filmed in April 1893 and was shown publicly (in a Kinetoscope viewer) at the Brooklyn Institute on May 9, 1893. According to the Internet Movie Database the film was made in a 35 mm format with an aspect ratio of 1.33:1. The movie was intended to be displayed through means of a Kinetoscope. A surviving 35-mm print of this film was found at the Henry Ford Museum; it is the source of the negative preserved by the Museum of Modern Art film archive. Another copy is at the Edison National Historic Site, administered by the National Park Service. Because the film was finished before 1923, its copyright has expired; it is freely available on the World Wide Web. ^ "Movies". Edison National Historic Site. Archived from the original on 2006-08-22. Retrieved 2007-03-14. ^ a b "PFSL : Blacksmith Scene". Silent Era. Retrieved 2007-03-14. ^ "Internet Movie Database Technical Specifications". Retrieved 2007-03-14.